Do you know how important wolves are to the earth’s ecosystem? Did you know that one of the greatest threats to wild wolves is man? Have you ever tried howling like a wolf? Learn more about wolves and have fun doing it at the Milwaukee County Zoo’s Wolf Awareness Day, Saturday, October 17, 2015. Observe the Zoo’s male timber wolf, Nikan, and learn from zookeepers the different species of wolves, interesting wolf behaviors, wolf reintroduction topics and how zookeepers care for Nikan. See how Nikan is fed by his keepers at 2 p.m. Visitors will see now that he’s older, he receives extra special attention from his caregivers. Watch an Environmental Enrichment Demonstration at 11 a.m. when you’ll see Nikan interacting with “toys” to help display his natural behaviors, just like he would in the wild. Can you howl like a wolf? Test your pipes in our Howling Contest at 1 p.m. Prizes will be awarded to the best adult and child howlers! Touch wolf and other North American animal artifacts at the Remains to be Seen Cart. New this year! At noon, hear Gloriann Klein from “Wolf Info Now” as she relays the history of Wisconsin wolf management and the current pending wolf issues. “Wolf Info Now” educates the public on national wolf issues, with a focus on the plight of Wisconsin wolves. Follow Gloriann at Twitter.com/WolfInfoNow. More about Nikan: Nikan arrived at our Zoo as a pup in 1999, along with his four siblings. Primarily due to old-age health issues, his siblings have passed away. At 16 ½-years-old, Nikan still enjoys a good quality of life, and takes part in daily training sessions with his keepers. 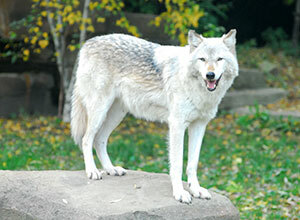 Each year, National Wolf Awareness Week takes place the third week of October. This year’s week, October 19-25, 2015, encourages conservation efforts not just for wolves, but also for all wild species. 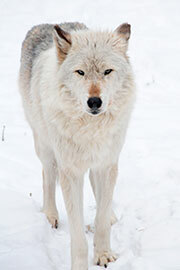 For more information on what you can do to preserve wolves and their habitats, visit the Defenders of Wildlife website. Please visit the Zoo during the Wolf Awareness Day on Saturday, October 17, 2015. For more information about Wolf Awareness Day activities, call the Zoo’s Public Affairs and Services Division at 414.771.3040.